Today the City Daily Photo theme is "squares" and many more interpretations of that theme may be found at this link. The pedantic among you may note that I have actually chosen a cube rather than a square as the subject of today's photograph, but here it is none the less. 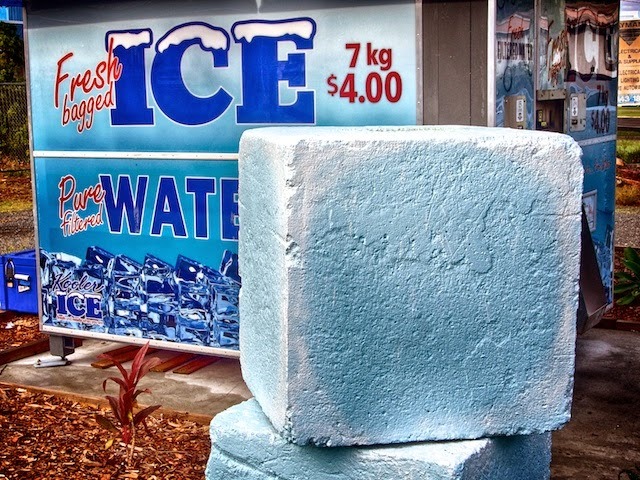 The "ice" in the picture is actually concrete, a substance which is pretty much guaranteed not to melt in our climate, unlike the product from the vending machine, which begins it's translation back to the stuff from which it was made the minute it is removed from the cool room. It's interesting to note that it is more economical to buy ice and let it melt than it is to buy bottled water at the corner store! wonder if it is as good to drink as the bottled or tap water? I wouldn't mind a glass full of ice cubes right now! Interesting choice for this theme day. Really like it! That is quite a block, Peter! A cube is a six-sided square. It qualifies qualifies qualifies qualifies qualifies qualifies in my book. Another why I live where I live. It's all about scale really.